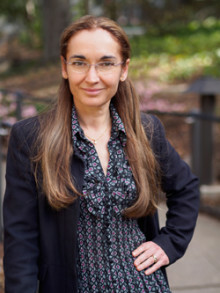 Professor Nogales is a Howard Hughes Medical Institute investigator; a Professor of Biochemistry and Head, Biochemistry, Biophysics and Structural Biology Division, Molecular Biology at the University of California, Berkeley and Senior Faculty Scientist at the Lawrence Berkeley National Laboratory. She is an elected member of the National Academy of Sciences of the USA, American Academy of Arts and Sciences and an elected Fellow of the American Society of Cell Biology. Professor Nogales is one of the foremost exponents of single particle cryo-electron microscopy, a technique that is taking the world of structural biology by storm. Her elegant work illustrates the power of cryo-EM in providing revolutionary insights into how large complexes and machines in our body function including ground-breaking studies on how the human genome is expressed and controlled.